I am feeling all about kids lately!! Here is another fun inside winter time kids activity I thought I would share with you!! Now just either join in on the fun or step away. Let them create how ever they wish. 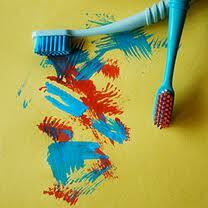 We pay next to nothing buying toothbrushes with coupons and here is another thing we can do with them! That’s a great way to save money! !